The hajj, which drew 2 million people from over 180 countries this year, is a huge logistical challenge for Saudi Arabia. The kingdom which earns billions of dollars , due to the Holiest Pilgrimage of Muslims from around the World , But adequate Preventive Measures and Precautions are not taken by the Ruling Govt , as this is neither the First Such Tragic Incident , which took lives of 100’s of Muslim Pilgrims , and under these circumstances , it looks Nor the Last Such Incident. Saudi authorities began an investigation, said Interior Ministry spokesman Maj. Gen. Mansour al-Turki, adding that initial reports showed two crowds coming from opposing directions converged at an intersection in Mina, on the outskirts of Mecca, when the pushing and shoving started. “Unfortunately, these incidents happen in a moment,” al-Turki said at a news conference. But four survivors questioned how officials managing the flow of people could allow two big crowds going in different directions to intersect on two streets packed with pilgrims. “What happened was more than they were ready for,” Lotfy, 44, told The Associated Press. As of late Thursday, the Saudi civil defense directorate said the death toll was 719, but that probably would rise as bodies continued to be counted and sent to the morgue. At least 863 people were injured, the directorate said. 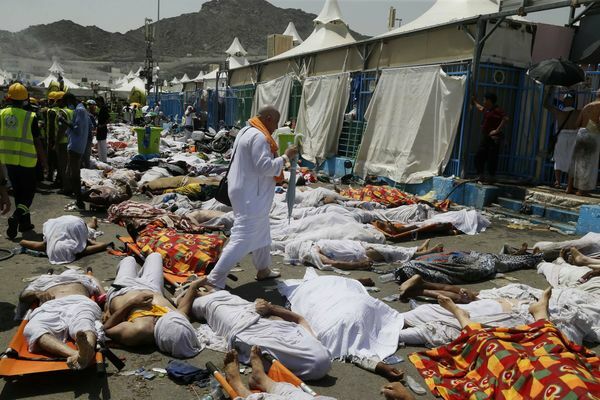 An AP journalist saw bodies still lying on the ground more than 10 hours after the crush and ensuing stampede in Mina, a large valley containing 160,000 tents for accommodations about 5 kilometers (3 miles) from Mecca. One crowd had just finished a ritual in which pilgrims throw pebbles at three stone columns representing the devil when it ran into another wave of people heading to perform the rite. Sudanese pilgrim Mohammed Awad, 36, and his 56-year-old father were separated when people began pushing and shoving. Awad said he tried to get out of the crush of bodies for about 30 minutes and eventually climbed over a gate with others. It took him an hour before he could look for his father, who was under at least 10 bodies — but still alive. “You can’t count how many bodies there were. They were stacked high,” Awad said. 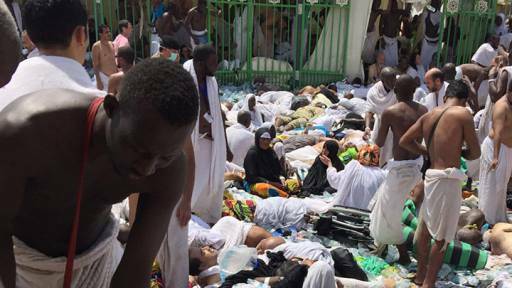 Amateur video on social media showed scores of bodies — many still dressed in the simple terry cloth garments worn during hajj — lying amid crushed wheelchairs and water bottles on a sunbaked street. Helicopters circled Mina throughout the day, ferrying the injured to hospitals, while military police blocked the streets where the deaths took place. About 100,000 security forces were deployed to manage the crowds and provide security for this year’s hajj, with 5,000 CCTV cameras throughout Mecca and Medina. Unlike the wide ramps leading to Jamarat, the streets amid the tents in Mina are narrow. The street where the accident took place is about 12 meters (36 feet) wide, with tall gates to the left and right. Behind the gates are the tents of hajj tour groups, organized by nationality. King Salman expressed his condolences and pledged a speedy investigation. He said he gave instructions for a review of “all existing plans and arrangements … to improve the level of organization and management of the movement” of the pilgrims. Saudi Arabia’s regional rival Iran immediately blamed the kingdom for mismanagement in the disaster. It was the second major accident during this year’s hajj season. On Sept. 11, a construction crane crashed down onto the Grand Mosque, killing 111 people and injuring more than 390. Authorities said high winds from a powerful storm caused the collapse and faulted the construction giant Saudi Binladin Group, which oversees construction at the mosque, for not following operating procedures. Sami Angawi, who founded the government’s Hajj Research Center in the 1970s and has studied the logistics of the hajj, said it is not enough for Saudi ministers and their deputies to meet a few times a year to oversee the planning and coordination of various agencies for the hajj. The tragedy came as Muslims around the world marked the start of the Eid al-Adha holiday, a traditionally festive time in which livestock is slaughtered and its meat distributed to the poor. The mood in Mina was somber, however, and many were stunned by the tragedy instead of jubilant at completing the pilgrimage. A visibly shaken Ismail Hamba, 58, of Nigeria, said he was on his way to cast stones when he suddenly became dizzy and fell down. “By the special grace of God … a young man rescued me,” he said at a small clinic at the site of the accident, adding that he doesn’t know how he survived. “It was terrible. It was really, really terrible,” said Hamba, who was making his second hajj. Thursday’s accident was the worst since a similar incident in 2006 near the same site when more than 360 pilgrims were killed in a stampede. Another stampede at Mina in 2004 killed 244 and left hundreds injured. The deadliest hajj-related tragedy was in 1990, when 1,426 pilgrims died in a stampede in an overcrowded pedestrian tunnel leading to holy sites in Mecca. The latest accident is certain to touch many different countries, and condolences poured in from around the world. U.S. National Security Council spokesman Ned Price said the U.S. joins in mourning for “the tragic loss of these faithful pilgrims,” while U.N. Secretary-General Ban Ki-moon was “deeply saddened” by the deaths, his spokesman said. In the Pakistani city of Lahore, Sajida Arif, said her father, Haji, was among the dead. “Before leaving for the hajj, he told me he had a wish to be buried in Mecca,” she said. All the Muslim World Leaders , Religious Scholars and Intellectuals have taken a Serious Notice of the Martyrdom of Hundreds of Muslim Pilgrims , 2nd time During the Same Years Holiest Pilgrimage of the Muslims , which is totally Under the Supervision of the Saud Monarchy . Allama Abbas Kumaili emphasized during his Comments on the occasion that as this is a declared fact that Hajj Pilgrimage is a Mandatory Part of Islam , for all the able Muslim Women and Men , and Mcca and Medina are the Holiest and the Center Place of Islam , While they are Under the Totally Under the Control and Supervision of Saudi Monarchy for decades , and the History tells that their have been Numerous disasters During the Hajj Pilgrimage in the Past Under their Supervision and Control , So Now as a Sizeable Population of Muslims is of the View , that Now is the time that the Supervision and Control of the Holy Lands of Mecca and Medina , should be given to a council of all the Muslims Nations and Representative of Muslims from around the World . In the better Interest of all the Muslims of the World , as the example of Rome already exists . He further added that The Aggression of Saudi Arabia and its Persian Gulf Neighbors on the Unarmed and Innocent Yemeni Muslim Civilians have also raised 101 Questions on credibility of the Saudi Monarchy , which is Killing Muslims , and Claims to be the Custodian of the Holiest Places of Islam , As Such Inhumane acts are a Direct Invitation to God’s Wrath. This entry was posted in Jafria, Middle East and tagged Custodian of Holy Mosque, Hajj, Holy Pilgrimage, Khadim e Harmain Sah, Muslims, saudi monarchy, Stampede. Bookmark the permalink.